Today for #SundaySupper we had to make a dish to share for Labor Day weekend! For me this dish was made twice, since I wasn’t happy with the first dish, I needed to revamp it and make it better!! And this dish is way better too!! 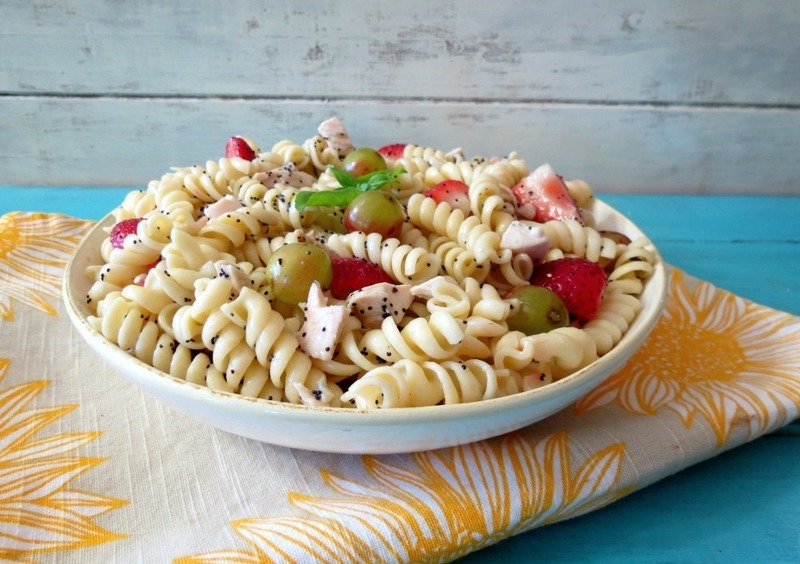 I am happy to share with you my Strawberries and Chicken Pasta Salad with Orange Poppy Dressing. 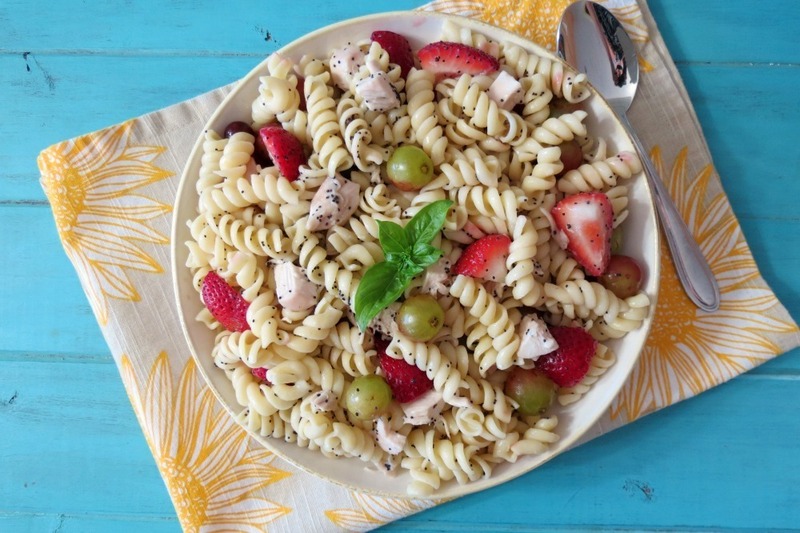 This salad is made with rotini pasta aka spirals, strawberries, grapes, chicken and it’s marinated in my orange poppy-seed dressing. It’s light, refreshing and so full of flavor, not to mention it’s pretty healthy for you too!!! For the pasta I used Dreamfields pasta, which is full of fiber and protein. I went for this pasta because it is white. If I use whole grain or a vegetable pasta my Husband won’t touch it. The pasta turned out perfect. No one would know it is healthy!! To flavor up the pasta, I used fresh strawberries and grapes that I got from my CSA box this week. In my original recipe I used blueberries to go with the strawberries, but I find grapes are nicer and more firm than blueberries. For the chicken, I cheated and used the breast meat of a rotisserie chicken. However if you prefer to make your own chicken, I recommend my marinated yogurt chicken, it makes the most moist chicken ever!!! That’s no joke!! For the dressing I made my orange poppy-seed dressing that I used on my fruit salad with grilled chicken recipe. I love this dressing because it’s light, refreshing and doesn’t contain any oil, plus it adds a wonderful orange flavor to the pasta. The poppy seeds also add a nice crunch!! The longer you let the dressing marinate in the pasta the more robust flavor you will get. The combination of the dressing with the chicken and fruit make a wonderful companionship! I just love it! I am so glad I remade my recipe because this one is so much better!!! Chilled noodles, fresh strawberries, crunchy grapes and chicken tossed in a sweet orange dressing. Cook pasta according to manufactures direction. When pasta is done, drain the water and add to a large bowl to cool. Once cooled, add chicken, strawberries, grapes and scallions. Lightly mix together; set aside. In a small bowl, add all of the dressing ingredients; whisk until combined. Pour dressing into pasta salad and mix until combined. Add salt and pepper to taste. Let the flavors marinate for one hour before serving. If you do not plan to serve this right away, add the fruit when ready to serve. Note: I meant to add scallions to the pasta, so please feel free to add about a ¼ cup. I totally forgot! I have a fun week planned for next week and I can’t wait to share it with you!! Be sure to stop back tomorrow! Thanks for participating this week! This pasta salad looks delicious. What a delicious and colorful salad! This looks so good, Jennifer! This looks great! I’ve been loving all of the fruited pasta salads I’ve seen popping up lately. Gorgeous salad, Jen! I just tried Dreamsfield pasta and it’s fabulous!!! I make a chicken salad with strawberries that I love, so I know I would LOVE this! So gorgeous! I’ve never thought of putting strawberries with pasta, I will have to try it! Give it a try, I bet you’ll like it! Our CSA box was extra good this week. No grapes though. Great use with this dish. Don’t you just love getting your CSA box? Mine was good too, and I am glad I got grapes this round. Hope to get them again soon! 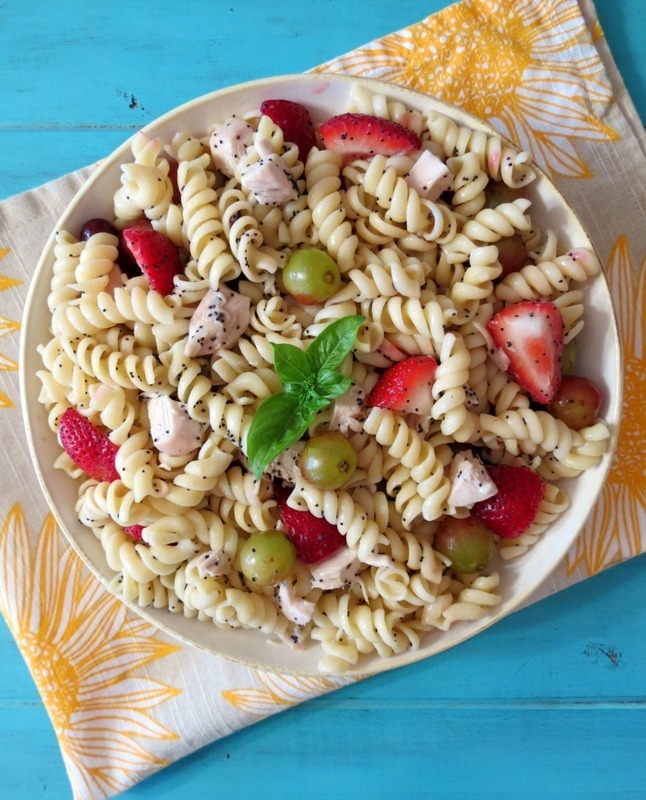 What a great idea to add strawberries to your chicken pasta salad! Thank you Diana! It is filling, yet it’s a nice light salad! I seem to always forget about how fruit like strawberries and grapes go so well with pasta. Even better with a citrus dressing. Lovely recipe. Thank you Renee! I know it seems kind of weird adding fruit to pasta, but it’s such a great match!! The colors are gorgeous! And, the dressing sounds wonderful and bright. Yum! Thank you so much Shannon!! A good pasta salad is what you need in a hot summer day. This salad sounds perfect. I’ll take a big bowl! This looks so yummy, I love the summery dressing! That orange poppyseed dressing sounds wonderful! I love the sweet version of pasta salad…so colorful too! 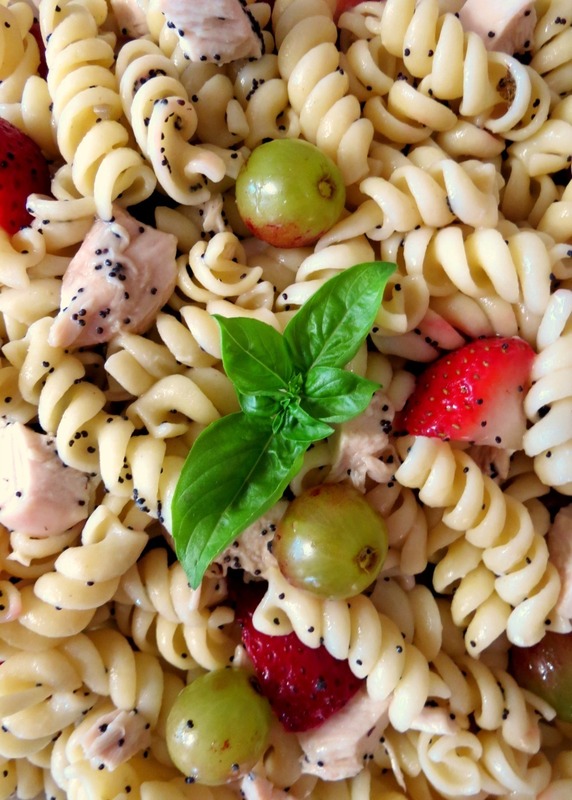 I love that this is a pasta version of my favorite salad at Panera – the strawberry poppyseed chicken salad! Thank you so much Marla! 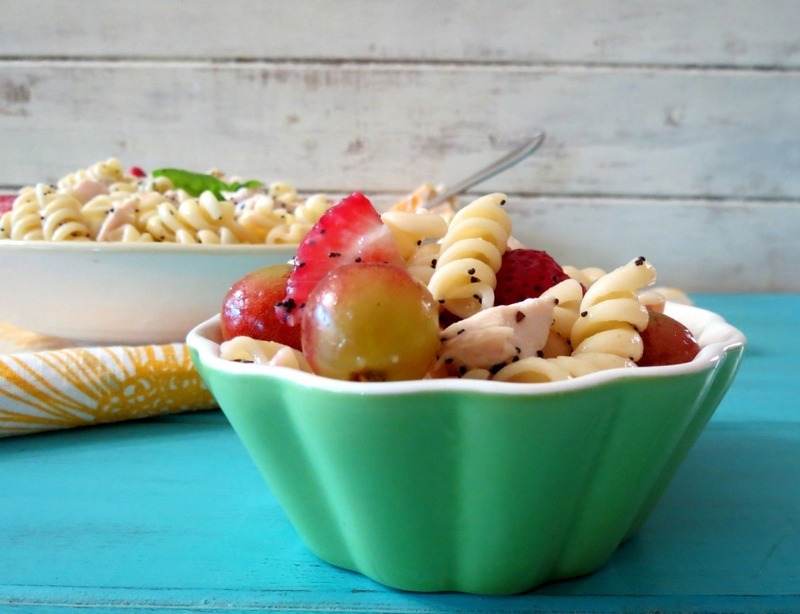 This sounds like a fresh and fruity twist on pasta salad and I’m loving the poppy dressing! I like strawberries and chicken together. I need to try it with pasta! Strawberries and chicken are a wonderful combo! One of my favorite summer time foods together! Looking at your pasta salad has made me realized I’ve barely made any this summer! Love the addition of fruit to yours! Thank you Susan! I never make enough pasta salad in the summer, I don’t’ know why because it’s so good cold and perfect for lunches! What a beautiful salad! I’ve never tried strawberries in a savory salad, but I’ll bet they make the perfect sweet/salty combo! Thank you Anne! This salad has it all and it’s so summery! 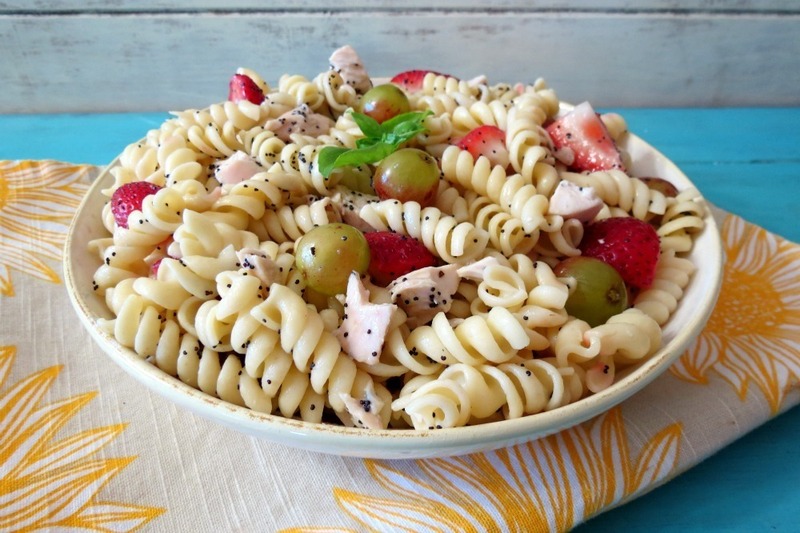 I love all the components of this pasta salad and the poppy seed dressing sounds delish, also! Such a beautiful summer salad. perfect dish for diet. My husband loved it. Please share more salad recipes.